RoHS Compliance ELV (End of Life Vehicle Directive 2000/53/EC) ELV is aimed at the reduction of waste arising from end-of-life vehicles. The scope of the directive is limited to passenger cars and light commercial vehicles. The directive covers aspects along the life cycle of a vehicle as well as aspects related to treatment operations. As such it aims at: • preventing the use of certain heavy metals such as cadmium, lead, mercury and hexavalent chromium • collection of vehicles at suitable treatment facilities • de-pollution of fluids and specific components • coding and/or information on parts and components • ensuring information for consumers and treatment organizations • achieving reuse, recycling and recovery performance targets WEEE (Waste Electrical & Electronics Environmental Directive 2012/19/EU) which replaces the old WEEE Directive 2002/96/EC which was repealed on 15 February 2014. WEEE is the European Community directive on waste electrical and electronic equipment which, together with the RoHS Directive 2002/95/EC, became European Law in February 2003. The WEEE Directive sets collection, recycling and recovery targets for all types of electrical goods. RoHS (Restriction of Hazardous Substances Directive 2002/95/EC and the more recent update RoHS2 (or RoHS Recast) Directive 2011/65/EU). RoHS is the European Community directive that restricts the use of specific hazardous materials found in electrical and electronic products. From 1st July 2006 applicable products sold in the EU must be RoHS compliant. RoHS bans the placing on the European market of new electrical and electronic equipment containing more than the agreed levels of Lead (Pb), Mercury (Hg), Cadmium (Cd), Hexavalent chromium (CrVI), Polybrominated biphenyls (PBB) and Polybrominated diphenyl Ethers (PBDE). There are a further 4 proposed substances: Hexabromocyclododecane (HBCDD) (a brominated Flame Retardant), Bis (2-ethylhexyl) phthalate (DEHP) (a commonly used plasticizer), Butyl benzyl phthalate (BPP) (a commonly used plasticizer) and Dibutyl phthalate (DBP) (a commonly used plasticizer). There are a number of exempted applications for these substances in annex III of the directive. Relevant to some of our products is lead, which is used as an alloying agent to improve machinability. Lead is allowed when used as an alloying element up to the following proportions: • 6(a) Lead as an alloying element in steel for machining purposes and in galvanised steel containing up to 0,35 % lead by weight • 6(b) Lead as an alloying element in aluminium containing up to 0,4 % lead by weight • 6(c) Copper alloy containing up to 4 % lead by weight Compliance Statement NP does not use Mercury (Hg), Cadmium (Cd), Polybrominated biphenyls (PBB), Polybrominated diphenyl ethers (PBDE), Hexabromocyclododecane (HBCDD), Bis (2-ethylhexyl) phthalate (DEHP), Butyl benzyl phthalate (BPP) or Dibutyl phthalate (DBP) in, or as a surface coating for any of its products. From 1st of January 2005 we have been replacing all plating processes that involved hexavalent chromium (CrVI) with a RoHS compliant CrIII (trivalent) process for all our electro-zinc plated fasteners. • All unplated steel parts are RoHS Compliant. • All steel electro-zinc plated fasteners with a part suffix of ZI, GZ, or SZ are RoHS compliant. • All steel electro-zinc plated fasteners with a part suffix of ZC6, GC6 or SZ6 are not RoHS compliant as they have CrVI based finishes. Our new trivalent based platings provide similar or better performance than the old hexavalent platings. Where corrosion resistance is an issue, please contact our technical sales department for clarification of expected performance. We can offer other RoHS compliant platings and coatings that can provide up to 1000 hours salt spray resistance if necessary. Some self-clinching fasteners that have a locking feature have a dry film lubricant applied. • Part numbers with a suffix of EF, ZF or F are not RoHS compliant because the dry-film lubricant contains cadmium and lead. Since 1st of January 2005 we have changed to an RoHS compliant molybdenum based dry-film lubricant and all parts with this finish have a part suffix of MD. 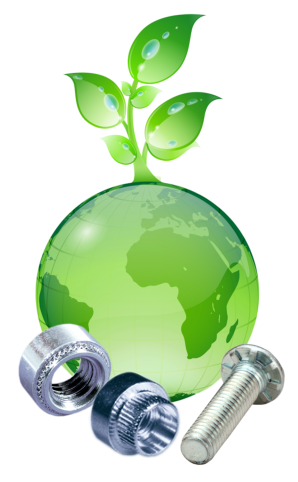 • All Stainless Steel parts with a part number suffix A2, A4, 400 or GS are RoHS compliant. • All Aluminium parts with a part number suffix AL or GA are RoHS compliant. • All Brass parts with a part number suffix BR, GB or B are RoHS compliant. • All Phosphor Bronze parts are RoHS compliant. • All electro-tin plated parts with a part number suffix ET are RoHS compliant. Future Compliance We will continue to monitor the situation regarding ELV, WEEE and RoHS to ensure that we are able to support our customers with compliant products into the future. If you require clarification relating to the compliance of any of our products, please contact our technical sales department. The board of directors. Northern Precision Ltd You can download a pdf version of this compliance statement here.